So here we are, once again, staring St. Patrick’s Day in the face. The day on which we see parades and pride and green beer. The day on which the flag being waved isn’t red, white and blue, but green, white and orange. The day on which so many people wear green. The day on which everybody, but everybody, either is Irish or wants to be Irish or simply assumes an Irish identity, at least for the day. Ah yes. Niall of the Nine Hostages. So… what if you’re not one of those one in 50… not an O’Connor or a Flynn … but you still need to prove that your male line actually does go back to Ireland? And you really really really want that guy that you match so tightly to be a man who has what you likely don’t have — a paper trail way back into Irish history. And … sigh … there aren’t a whole lot of men living in the United States who have that kind of paper trail. There are — no surprise here — a whole lot more men living in Ireland who have that kind of paper trail. So what can you do to help change that? Pay up. Pay it forward. You can contribute towards the cost of a YDNA kit to be used for a test of someone living in Ireland with your surname. Many Irish clans now have yDNA surname projects. These are based on the inheritance of the yDNA chromosome down through the paternal line. This kind of project is ideally suited to families bearing Irish patronymic surnames as the yDNA results generally reflect the surname. 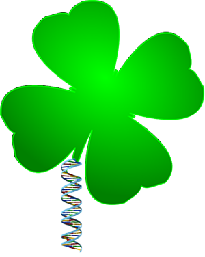 The goals of Irish yDNA surname projects usually include the primary one of finding of relatives in Ireland. The goals sometimes include the desire to verify paternal ancestry and the identification of place of origin of the family. A history of the clan and its various branches can also be part of the goals of Irish Surname projects. It has been the case for years that “Irish” yDNA Surname Projects have attracted people from many countries but they held little interest for the Irish who were still resident in Ireland. The argument has been that Irish who live in Ireland “know where they come from” and don’t need to do DNA tests. Irish-based families may wish to connect with relatives, who may have emigrated in times past, where there is no paper trail or living memory to help with making these connections. How many people in Ireland can say “most of my family emigrated in the Famine and we have no idea where they went or who their descendants are”. Or “we have no contact with branches of our family who left Ireland a long time ago”. Must this be the case? DNA can open doors for the Irish who have lost track of relatives. It then lists 39 clans with YDNA Surname Projects — plus the overarching Ireland Heritage yDNA Project — for a total of 40 projects that you can join with your own test results. But how can you help convince the Irish still in Ireland to test? That’s where the “pay up, pay it forward” part comes in. Because, in my experience, the easiest way to convince folks to hand over a DNA sample when they’re not particularly interested in DNA testing themselves is to make it as painless to them as possible. And that means paying — or helping to pay — for the test. Now I’ll be the first to admit that contributing to a project’s general DNA fund is a little bit like buying a pig in a poke. You personally won’t get to say specifically who the test kit will go to (unless you’re paying the entire cost for a particular person),9 and you may contribute weeks, months, even years before somebody in Ireland who meets the project’s wish list ever is found who’s willing to test. And the Group Administrator has discretion in picking the person to test if more that one candidate appears. But if a project you’re particularly interested in can say, on its website, “We will pay 100% (or 50% or whatever) of the cost of a 67-marker YDNA test for a man who ___,” it’s a whole lot more likely that a man who can fill in that blank will decide to go ahead and test. 1. Head over to the Family Tree DNA group general fund contribution page. 2. Find the project you want to contribute to by, first, using the small dropdown box to the left to get to the initial number or letter of the group (say, I for Ireland) and then the bigger dropdown box to the right to find the specific project (say, Ireland yDNA). 3. Fill out the donation amount. 5. Add your note about what you want the money used for. Finally, you need to decide whether to contribute online (using PayPal or a credit card) or by mail. If by mail, you can print out the form and sent it and your check to the address at the bottom. If online, click on one of the buttons (PayPal or a credit card) and follow the prompts through. And there you have it. A somewhat different way to help celebrate St. Patrick’s Day. Just looking to expand knowledge! Happy St Pats & all that.. Absolutely worth looking at all hereditary illnesses, Denise — and hemochromatosis isn’t just among the Irish! The Irish are not related closely to Basque on autosomal dna. The closest population to the Irish using autosomal dna is other British populations. Even using y R1b the Irish aren’t particularly close to the Basque. It’s like saying the closest population to the Dutch is Basque. It doesn’t make much sense. Tell that to the folks who did the Irish study. They seem to think so! I think the Irish study was based on research that was done about 10-15 years ago. The closest relatives of the native Irish – not the so-called “Scots-Irish” who are just British colonists – are the Welsh and the western Scots.